At 6:45 am on Bright Monday, 6 May 2013, we set out on our holiday trip to Namibia and Botswana. We drove west through Pretoria, stopping at Broederstroom to fill up with petrol, and passing the Hartebeeshoek Satellite tracking station, to Magaliesberg. I went to school at Magaliesberg for a few years, so the place is familiar to me, and has changed little in 60 years. I went to the Mountain Lodge Prep School, which closed at the end of 1952. 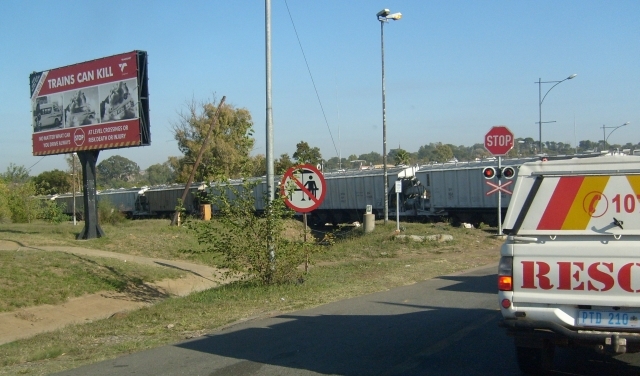 On the road down to Magaliesberg we waited at the level crossing for a train to pass, four or five diesel locomotives pulling soda ash cars. When I was at school there, that used to be the main line to Rhodesia, through Botswana, and the trains were pulled by Garrett steam engines. We used to put pennies on the rails so that the trains would squash them. The stop sign at the level crossing has flashing lights to warn when a train is coming, and nearby is an advertising hoarding with spectacular photos of a minibus taxi disintegrating after being hit by a train, with the legend “Trains can kill”. Then on through Derby and Koster, which we reached at 9:25 am, 166.5 km from Kilner Park. Two of my fellow pupils from Mountain Lodge School, Ross and Judy Gilfillan, had lived in Koster, where their father was a farmer. I wonder what happened to them. Like many of the towns in that part of the world, it has a prominent grain silo. We went through Koster to avoid the N4 toll road. The non-toll route is some 80 km longer, but the extra petrol would cost less than half the toll at the Swartruggens toll gate alone, which is one of the most expensive in the country. We then went to Lichtenburg, a road I had taken in 1969, when I first went to live in Namibia. Then I had had a puncture there, and had had to buy a new tire in Lichtenberg, which meant I would not haver had enough money for petrol to get to Windhoek. I took a detour down to Postmasburg, where a student friend, Clare Isted, was teaching at the local high school, and borrowed R10.00 from her, which in those days was enough for a couple of tanks of petrol. As we learned in geography klessons in school, Lichetenburg was one of the corners of the maize triangle, hence all the grain silos in the towns we had just passed through. We reached Lichtenburg about 11:00, 260 km from home, and wandered up and down the main street, Nelson Mandela Drive, looking for a place to have breakfast or lunch. I didn’t recognise anything from when I was here 44 years ago. I recalled that an old friend Mike Wimmer was once rector of the Anglican parish here, and wonder what happened to him. Eventually we had lunch at Maxis, one of several restaurants in the vicinity in converted houses. The surroundings were pleasant, but the food less so. Val had tramezzini, and I had their “English breakfast” — two fried eggs with bacon, chips, tomato and boerewors, since it was Bright Week. But the bacon was tough and leathery, and the boerewors tasted funny — I wondered if it was one of those with kangaroo meat in it. We left at 11:50, this was new territory for us, along roads which neither of us had travelled before. We stopped at a garage in Mafikeng at 12:30 to fill up with petrol, though we didn’t really need to, as there was still half a tank left, but we wanted to be able to pay with a credit card, rather than have buy it for cash with our limited supply of Pula in Botswana. 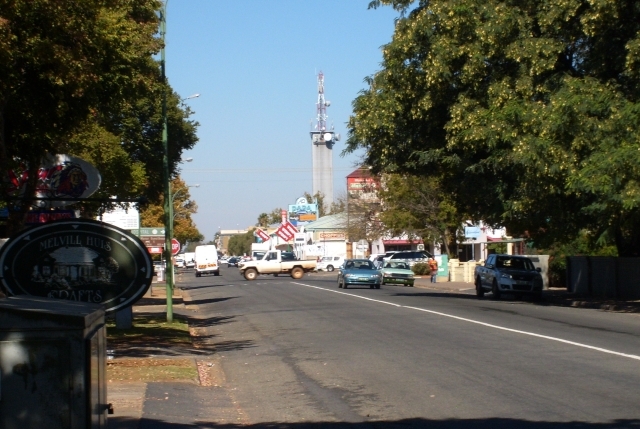 Mafikeng, or Mafiheng, is famous for having been besieged during the Anglo-Boer War, and for a while the word “Mafficking” was used to describe exuberant celebrations such as those the Brits held when they heard that the siege had been broken. One of the lasting results of the siege has been the Boy Scout movement. Mahikeng, Mafikeng, or Mafeking — choose your own spelling! passports and road fund papers before opening the gate, and asked what I did, and I said I was a moruti, and he said, “Ah, umfundisi” and said that in Botswana I would be called a pastor. That struck me as a little odd. How did he know we were originally from Natal, that he used the Zulu term, and why “moruti” does not seem to be used in Botswana. We stopped to take some photos on the road between Ramatlabama and Kanye. 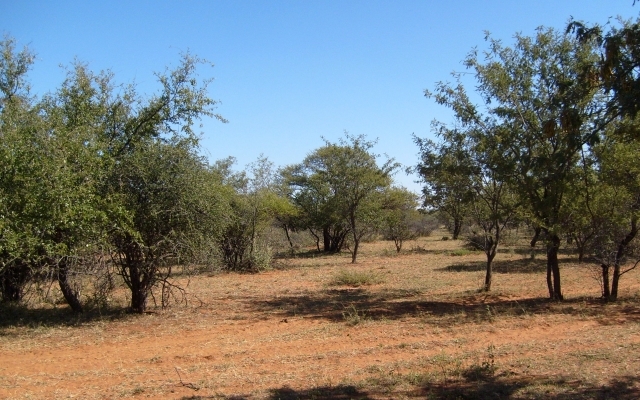 Part of the purpose of our journey is to follow in the footsteps of Val’s great great grandfather Fred Green, who was an explorer and elephant hunter in what is now Namibia and Botswana, and when he travelled from Bloemfontein in the late 1840s and early 1850s with his brother Charles to hunt in the region of Lake Ngami, he would have traversed country very like this in his oxwagons. The Green brothers would have had to wind their way through the thornbushes with their ox wagons, but there we were on this long straight tarred road, with no other traffic visible the whole time we were stopped. The thorn bushes were cleared from the verges of the road, leaving only a few bigger trees and grass, which attracted grazing animals — cattle, donkeys, goats, and, more rarely, flocks of sheep. Many of them were lying under the trees in the shade to escape the midday sun. The Botswana roads seemed better-maintained than the South African ones. The animals seemed to be there even though the fences were intact, and there seemed to be no sign of human habitation, and no herders looking after the animals either. We reached Kanye at 2:30, 440 km from home, and saw the first road sign that indicated the road to Windhoek. It was the first hilly bit we had seen since arriving in Botswana — the rest of the country had been very flat. We continued on the road to Jwaneng, and arrived there at about 3:25, 526 km from home, and stopped at a garage to buy cold drinks and go to the loo, for which one had to pay 1 pula. There were a few smaller villages, where we had to slow down to 80 km/h, but many of them were not marked on the maps, and as the afternoon got later we saw more animals on the road. We eventually reached Kang at about 6:00 pm. We stayed at the Kang Ultrastop, which was quite pleasant, had supper at their restaurant, and went to bed early. We left a couple of our BookCrossing books there.